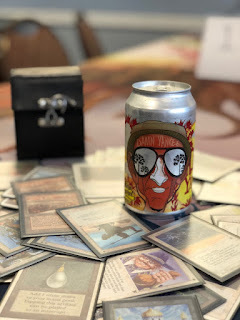 A couple of weeks ago a regular at the Danish Old School community’s Facebook-page posted the photos below, along with a description of a horrible washing machine malfunction and some less-than-advisable storage of Old School cards (i.e. in the basement). 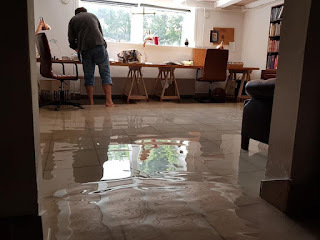 This flooding came during one of the worst droughts in Danish history, so, naturally, the shock and horror in the community reached some heights. So this might be the epitome of the occasional "Ha, I don't have an editor!"-posts. Hopefully somebody might enjoy the concept or the plain oddity as content goes. Flow is inspired by the 14th century Syrian manuscripts; the translation of the frame story in the end is a version suggested by Husain Haddawy (though not verbatim). This was fun to write. It is said, O wise and happy King, that one morning the caliph Harun-al Rashid woke up and said "Today I shall walk in my city as a common man to observe my people and learn of their piety. For there is no other power but that of God." 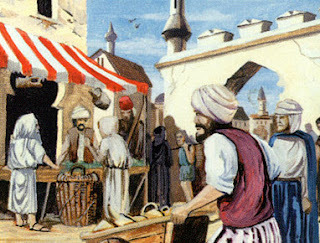 The caliph and his most trusted vizier Ja'far then dressed up as merchants and walked down the streets of Baghdad. Tar Heels, Gamecocks, and Bulldogs, oh my! When I started playing, the perceived power level of a card was directly correlated to the size of the numbers in the lower right corner. Eventually we got a little better at evaluating cards and building decks, and at some point it became clear that Mahamothi Djinn was in fact better than Leviathan. The months kept passing, and as we progressed we found ourselves caring about mana cost, tempo and consistency in a way we didn’t see when we first picked up the cards. Erhnam Djinn was better than Craw Wurm. I should play four Hypnotic Specters. Cards should be playable on their own, but if they also had synergy that could turn them greater than the sum of the parts we were golden.